Selected in the second round (33rd overall) of the 2010 NBA Draft by the Sacramento Kings…signed by the Kings on July 8, 2010…waived by Sacramento on July 16, 2012…signed by the Sioux Falls Skyforce of the NBA G League on Dec. 5, 2012…traded by the Skyforce to the Rio Grande Valley Vipers in exchange for Damian Saunders on Jan. 3, 2013…signed with Amchit Club of the Division A Lebanese Basketball League in May 2013…signed with Jin Qiang Sichuan of the Chinese National Basketball League on May 26, 2013….signed with Al Moutahed Tripoli of the Division A Lebanese Basketball League on Nov. 13, 2013…signed with Jiangsu Tongxi of the Chinese Basketball League in May 2014…signed by the Memphis Grizzlies on Sept. 25, 2014…waived by Memphis on Oct. 22, 2014…re-signed by the Grizzles on Nov. 19, 2014…waived by the Grizzlies on Nov. 20, 2014…joined the Iowa Energy on Nov. 21, 2014…signed by the HEAT as a free agent on Nov. 24, 2014…re-signed with the HEAT on July 7, 2016. Has appeared in 271 NBA regular season games (206 starts) during his six-year career and has averaged 13.6 points, 11.4 rebounds, 2.44 blocks and 26.8 minutes while shooting 57.5 percent from the floor and 62.7 percent from the foul line…has officially missed 80 games due to injury, 39 as a DNP-CD, 35 as a healthy scratch on the inactive list, 36 games while on assignment to the NBA G League, two as a DND and two games due to NBA-imposed suspensions…was named to the NBA All-Defensive Second Team once and has been named the Eastern Conference Player of the Week once…has led the NBA in blocks (2015-16), rebounds per game (2016-17) and defensive rebounds per game (2016-17) one time each…owns the HEAT single-season record for field goal percentage (.628 in 2014-15), defensive rebounds (795 in 2016-17), total rebounds (1,088 in 2016-17) and double-doubles (58 in 2016-17)…is the only player in HEAT history to score 1,000 points and grab 1,000 rebounds in the same season (2016-17)…owns franchise records for blocks in a game, blocks in a second half, total rebounds in a quarter and defensive rebounds in a quarter and shares the record for total rebounds in a first half…ranks among Miami’s all-time leaders in field goal percentage (2nd), blocks (3rd), double-doubles (3rd), offensive rebounds (6th), defensive rebounds (6th), total rebounds (6th), scoring average (13th), free throws attempted (13th), double-figure scoring efforts (15th), starts (15th), points scored (16th), field goals made (16th), free throws made (16th), field goals attempted (17th) and minutes played (19th)…has led the HEAT in offensive, defensive and total rebounds, rebound average and blocks in each of the past four seasons…has scored in double figures on 192 occasions, including 59 games with at least 20 points and four 30-point efforts…his career high for consecutive games scoring in double figures is 28 (Feb. 25-Nov. 5, 2017)…has grabbed double-figure rebounds 178 times, including 15 games with at least 20 rebounds…his career high for consecutive games grabbing double-figure rebounds is 19 (Feb. 11-Mar. 26, 2017)…has recorded eight 20-point/20-rebound games and one 30-point/20-rebound game…has blocked double-figure shots four times…has posted 149 double-doubles and four triple-doubles…his career high for consecutive games with a double-double is 15 (Feb. 25-Mar. 26, 2017)…has 175 multi-block games and 36 multi-steal games…his career high for consecutive games with a blocked shot is 47 (Feb. 9-Nov. 30, 2016) and his career high for consecutive games with multiple blocks is 23 (Apr. 11-Dec. 11, 2015)…his high for consecutive games shooting at least 50 percent from the floor is 12 (Mar. 31-Nov. 5, 2015)…has shot at least 54 percent from the floor in each of the past four seasons…has topped the HEAT in scoring 51 times, in rebounds 204 times and in blocks on 181 occasions…has started all 15 NBA postseason games in which he’s appeared and has averaged 9.7 points, 9.3 rebounds, 2.27 blocks and 24.5 minutes while shooting 62.9 percent from the floor and 59.6 percent from the foul line…has sat out four postseason games due to injury…has scored in double figures in eight postseason contests, including one 20-point effort…has grabbed double-figure rebounds in postseason play eight times and has posted seven postseason double-doubles…ranks among Miami’s all-time postseason leaders in double-doubles (8th), dunks (8th) and blocks (9th)…has appeared in 65 NBA G League games (15 starts) and averaged 7.2 points (.590 FG%, .549 FT%), 5.5 rebounds, 2.34 blocks and 13.7 minutes…has appeared in 20 Division A Lebanese Basketball League games and averaged 19.9 points (.553 FG%), 14.4 rebounds, 4.00 blocks, 1.5 assists and 34.5 minutes…has appeared in 44 Chinese National Basketball League games and averaged 27.2 points (.583 FG%), 16.5 rebounds, 4.80 blocks, 1.21 steals, 1.1 assists and 40.9 minutes. Started all 77 games in which he appeared for the HEAT and averaged 17.0 points (.557 FG%, .628 FT%), 14.1 rebounds, 2.09 blocks and 32.6 minutes…officially missed three games due to injury and was a DNP-CD twice in games in which he dressed but was only available in an emergency…sat out four games (Jan. 1-6) due to a right retinal contusion, the final game was officially listed as a DNP-CD…sat out one game (Jan. 27 at Chicago) due to a sprained right ankle which was officially listed as a DNP-CD…was named the Eastern Conference Player of the Week for the week ending Mar. 19…set franchise single-season records for both defensive and total rebounds, rebounds per game, double-doubles and double-figure rebound games…topped the NBA in rebounds per game and defensive rebounds per game and ranked among the league leaders in defensive rebounds (2nd), multi-block games (tied-2nd), total rebounds (3rd), double-figure rebound games (tied-3rd), offensive rebounds per game (4th), blocks per game (4th), double-doubles (tied-4th), offensive rebounds (6th) and field goal percentage (8th)…set single-season career highs in games played, starts, minutes, field goals made and attempted, free throws made and attempted, offensive, defensive and total rebounds, assists and steals…led the HEAT in games played, starts, field goals made, field goal percentage, offensive, defensive and total rebounds, blocks, double-doubles, double-figure rebound games, dunks (163) and three-point plays (31)…became the first player in franchise history to score 1,000 points and grab 1,000 rebounds in the same season…topped Miami in points 24 times, in rebounds a single-season franchise record 75 times, in blocks a team-high 49 times, in minutes 15 times, in plus/minus 13 times and in steals on nine occasions…led the HEAT in rebounds in each of the final 35 games (Jan. 28-Apr. 12) to establish a franchise record for consecutive games leading Miami in rebounds (bettering his previous franchise record of 33 from Oct. 26-Dec. 29 to open the 2016-17 season)…scored in double figures 66 times, including 28 games with at least 20 points and four 30-point performances (all are single-season highs)…grabbed double-figure rebounds 66 times and amassed 58 double-doubles (both set career highs)…amassed double-figure rebounds in a franchise-record and career-high 19 consecutive games from Feb. 11-Mar. 26…posted a double-double in a franchise-record and career-high 15 consecutive games from Feb. 25-Mar. 26…grabbed at least 20 rebounds in a game a career-high seven times (tying the HEAT single-season high) and recorded five 20-point/20-rebound games to set a single-season franchise record…grabbed 30.4 percent of all Miami’s rebounds for the season to set a franchise single-season high…set a franchise record for defensive rebounds in a quarter (12 in the third quarter) vs. Boston on Dec. 18…recorded his first career 30-point/20-rebound game on Feb. 4 vs. Philadelphia in just 26:47 minutes (the quickest 30/20 game in NBA history since minutes became an official stat in the 1951-52 season)…in the Feb. 4 game vs. Philadelphia he recorded a double-double in just 9:40 minutes, the fastest double-double in a game since Dwight Howard did it in 9:28 minutes vs. Utah on Mar. 15, 2009…tallied 49 multi-block games…hit 12 straight field goal attempts from Mar. 17-19, the high on the HEAT in 2016-17…grabbed his 2,000th career rebound on Feb. 1 vs. Atlanta…recorded his 500th career block on Feb. 4 vs. Philadelphia…played in his 200th career game on Mar. 8 vs. Charlotte…scored a career-high 32 points on Nov. 21 at Philadelphia and matched it on Dec. 20 vs. Orlando…matched his career high with 25 rebounds vs. Atlanta on Nov. 15…Season Highs: 32 points (twice), 25 rebounds (vs. Atlanta, Nov. 15), six blocks (vs. Milwaukee, Nov. 17), three assists (twice), three steals (vs. Phoenix, Mar. 21) and 46:59 minutes (vs. Orlando, Dec. 20). Appeared in 73 games (43 starts) for the HEAT and averaged 14.2 points (.606 FG%, .650 FT%), 11.8 rebounds, 3.68 blocks and 29.1 minutes…missed eight games due to injury and sat one game (Feb. 19) due to an NBA-imposed suspension…missed one game (Jan. 4) due to a sore right knee, one game (Jan. 11) with right knee tendinitis and six games (Jan. 22-Feb. 2) with a strained left hip…was named to the NBA All-Defensive Second Team and finished third in the voting for Defensive Player of the Year…led the NBA in blocks and ranked among the league leaders in field goal percentage (3rd), total rebounds (3rd), rebounds per game (3rd), defensive rebounds per game (5th), offensive rebounds (tied-7th), defensive rebounds (7th) and offensive rebounds per game (9th)…his 269 blocks were 92 more than the next highest player in the league and were the second-most in HEAT history for a single season…became just the second player in NBA history to shot over 60 percent from the field and block at least 250 shots in a single-season, joining Kareem Abdul-Jabbar (1979-80)…blocked at least five shots 22 times, the second-most for a single-season in team history…blocked his 300th shot as a member of the HEAT on Feb. 20, doing so in his 94th game, the fastest in team history…his 9.7 block percentage was the highest in the NBA this season as no other player had a percentage higher than 6.1…helped Miami average 6.48 blocks per game, the highest single-season average in team history…recorded 62 multi-block games…ended the season blocking a shot in a career-high 29 consecutive games…scored 1,040 points to become just the third player in the NBA over the last 10 seasons to score at least 1,000 points and block 250 shots in a single-season, joining Dikembe Mutombo (1996-97 & 1997-98) and Alonzo Mourning (1999-00)…joined Dwyane Wade (1,409), Goran Dragić (1,018) and Chris Bosh (1,010) to mark just the second time in franchise history four players reached the 1,000-point plateau during a single-season…posted nine 20-point games off the bench, the third-most by a reserve in team history…scored in double-figures 53 times, including 16 20-point games…averaged 11.84 rebounds, the highest average in team history, surpassing the previous mark of Rony Seikaly’s 11.82 average in 1991-92…recorded his 1,000th rebound as a member of the HEAT on Feb. 22, doing so in his 95th game, the fastest in team history…grabbed double-figure rebounds off the bench in 13-straight games from Feb. 20-Mar. 14, the longest streak by a reserve in franchise history and the longest in the NBA since Paul Silas did so from Mar. 9-28, 1975…posted seven games of at least 10+ rebounds and 5+ blocks, all off the bench, the most by a reserve in the NBA over the last 40 years…posted at least 10 points, five rebounds and a block in 13 consecutive games off the bench from Mar. 4-30, the longest such streak in NBA history…grabbed 23 rebounds off the bench on Feb. 20, the most by a Miami reserve in franchise history…scored 25 points in the same game, becoming the first Miami player to post a 20-20 game off the bench and the first in the NBA since Detlef Schrempf on Feb. 11, 1992…he also posted the 25-20 game in under 30 minutes of action, becoming just the second player since starting line-ups were kept in 1970-71 to post at least 25 points and 20 rebounds off the bench in under 30 minutes of action…led the team with 41 double-doubles, the fifth-most for a single-season in franchise history…24 of those came off the bench, the most double-doubles by a reserve in team history…led the team in double-figure rebound efforts with 53, the second-highest single-season total in team history…recorded a team-high 15 games of 15+ rebounds…posted three triple-doubles, all with blocks, marking the most with blocks in the NBA for a single-season over the last 20 years…recorded an NBA-best 95 defensive rating, the best in the league over the past five years…helped Miami hold opponents to 98.4 points, ranking as the third-least in the Eastern Conference and fifth-least in the entire NBA this season…Season Highs: 27 points (vs. Brooklyn, Mar. 28), 23 rebounds (vs. Washington, Feb. 20), 11 blocks (at Denver, Jan. 15), three steals (twice), two assists (five times) and 41:09 minutes (vs. Indiana, Feb. 22). 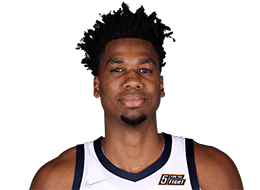 Split the season between the HEAT and Memphis Grizzlies of the NBA and the Sioux Falls Skyforce and Iowa Energy of the NBA Development League…officially missed four games due to injury…sat out Dec. 21 with a left toe injury and Jan. 21 with a sprained right ankle…missed a pair of games (Mar. 27-29) while on the inactive list with a right hand laceration…was officially listed as a DNP-CD on 15 occasions, including a total of five games where he dressed but was injured (three with a sprained right ankle and two with a right hand laceration)…missed one game (Mar. 11 vs. Brooklyn) due to an NBA-imposed suspension…missed one game (Dec. 14) while on assignment to Sioux Falls…finished in fourth place in the voting for the NBA’s Most Improved Player Award…appeared in 48 games (32 starts) for the HEAT and averaged 11.8 points (.628 FG%, .500 FT%), 10.0 rebounds, 2.56 blocks and 23.8 minutes…set the HEAT single-season franchise record for field goal percentage…led the HEAT in offensive, defensive and total rebounds, rebounds per game, field goal percentage, blocks, blocks per game, dunks (86) and double-doubles…topped the HEAT in scoring seven times, in rebounds and blocks 36 times each (both team highs), in steals on four occasions and in minutes once…was Miami’s leading scorer off the bench on seven occasions and also led the HEAT reserves in blocks 11 times, in rebounds 10 times and in steals three times…scored in double figures on 34 occasions, including four 20-point performances…grabbed double-figure rebounds 24 times, including four games with at least 20 rebounds (the fourth highest single-season mark in franchise history and the most in a single-season since Rony Seikaly set the franchise record with seven in 1992-93)…tallied three of the top six single-game rebound totals in HEAT history…tallied 22 double-doubles and one triple-double…recorded his lone career triple-double and the first in HEAT history by a non-starter finishing with 14 points, 13 rebounds and a franchise-record 12 blocks in 24:37 of action at Chicago on Jan. 25, becoming the first player in NBA history to record a triple-double with blocks in less than 25 minutes of action since blocks became an official NBA statistic in 1973…in addition to setting the single-game record for blocks at Chicago he also set the franchise record for blocks in a second half with seven...his 12 blocks at Chicago marked the single-game high by an individual in the NBA in 2014-15…had 16 points and a game-high 24 rebounds vs. Dallas on Jan. 30 and in the process set the franchise record for total rebounds in a quarter (14 in the first quarter) and tied the franchise record for defensive rebounds in a quarter (8 in the first quarter)…recorded the first 20-point/20-rebound game of his career with team highs in points (24) and rebounds (game-high 20) at Minnesota on Feb. 4…grabbed a career-high 25 rebounds against the L.A. Lakers on Mar. 4 and matched the franchise record for total rebounds in a first half (17)…made a career-high 12 consecutive field goal attempts from Feb. 3-4, the high on the HEAT in 2014-15…did not appear in a game with the Grizzlies before being released, was a DNP-CD (Nov. 19 at Toronto) in his lone game with Memphis…started all four D-League games in which he appeared with Sioux Falls and Iowa and averaged 21.8 points (.870 FG, .636 FT%), 14.8 rebounds, 5.00 blocks and 28.0 minutes…in three games with Iowa he averaged 22.0 points (.857 FG%, .667 FT%), 15.7 rebounds, 5.33 blocks and 28.7 minutes…in his lone game with Sioux Falls he tallied 21 points (10-11 FGs), 12 rebounds and four blocks in 26:02 minutes…Season Highs: 24 points (twice), 25 rebounds (vs. L.A. Lakers, Mar. 4), 12 blocks (at Chicago, Jan. 25), three steals (at Minnesota, Feb. 4), one assist (six times) and 37:33 minutes (vs. Chicago, Apr. 9). Split the season between Jiangsu Tongxi of the Chinese Basketball League and Al Moutahed Tripoli of the Division A Lebanese Basketball League…appeared in 17 games for Jiangsu Tongxi and averaged 29.6 points (.621 FG%), 16.4 rebounds, 4.29 blocks, 1.3 assists and 38.4 minutes…was named Asia-Basket.com All-Chinese NBL Center of the Year, First Team and All-Imports Team…appeared in 16 games for Al Moutahed Tripoli and averaged 20.6 points (.543 FG%), 14.8 rebounds, 4.10 blocks, 1.5 assists and 34.8 minutes…was named Asia-Basket.com All-Lebanese League Center of the Year, First Team and All-Imports Team. Split the season between the Sioux Falls Skyforce and the Rio Grande Valley Vipers of the NBA Development League, Jin Qiang Sichuan of the Chinese National Basketball League and Amchit Club on the Division A Lebanese Basketball League…appeared in 36 NBA D-League games (three starts) and averaged 6.6 points (.568 FG%, .658 FT%), 5.3 rebounds, 1.92 blocks and 11.8 minutes…came off the bench in all 29 games in which he appeared for Rio Grande Valley and averaged 5.7 points (.533 FG%, .667 FT%), 4.7 rebounds, 2.03 blocks and 10.1 minutes…appeared in seven games (three starts) for Sioux Falls and averaged 10.3 points (.667 FG%, .640 FT%), 7.7 rebounds, 1.43 blocks and 15.9 minutes…appeared in 27 games for Jin Qiang Sichuan and averaged 25.7 points (.559 FG%), 16.6 rebounds, 5.11 blocks, 1.41 steals and 42.4 minutes…was named Asia-Basket.com All-Chinese NBL Center of the Year, Defensive Player of the Year, First Team, All-Imports Team and Chinese NBL Finals MVP as the team captured the Chinese NBL Championship…appeared in three games for Amchit Club and averaged 17.3 points (.564 FG%), 12.7 rebounds, 3.33 blocks, 1.7 assists and 31.0 minutes. Split the season between the Sacramento Kings and the Reno Big Horns of the NBA Development League…was officially listed as a DNP-CD on 21 occasions, including the final seven games (Apr. 13-26) of the season when he dressed but sat out due to a sprained right ankle…missed a total of 17 games while on assignment to Reno from Jan. 2-Feb. 2…was a healthy scratch on the inactive list on 10 occasions…came off the bench in all 18 games in which he appeared for Sacramento and averaged 1.6 points (.444 FG%, .417 FT%), 2.2 rebounds, 0.83 blocks and 6.1 minutes…topped the Kings in rebounds once…grabbed double-figure rebounds once…appeared in 11 games (five starts) for Reno and averaged 7.8 points (.521 FG%, .343 FT%), 6.5 rebounds, 3.00 blocks and 18.9 minutes…scored in double figures four times with the Big Horns…grabbed double-figure rebounds twice and recorded one double-double with Reno…NBA Season Highs: Five points (at Denver, Mar. 5), 10 rebounds (vs. Houston, Apr. 8), three blocks (vs. Phoenix, Apr. 3), one steal (three times) and 19:44 minutes (vs. Houston, Apr. 8). Split the season between the Sacramento Kings and the Reno Big Horns of the NBA Development League…missed the final 37 games of the season after suffering a partial patellar tendon tear in his left knee at practice on Jan. 31…was a healthy scratch on the inactive list 25 times and a DNP-CD once (Nov. 6 vs. Memphis)…missed 18 games while on assignment to Reno…made his NBA debut with the Kings at Minnesota on Oct. 27, 2010 in his lone NBA game of the season and was scoreless in 1:45 of action…appeared in 14 games (three starts) for Reno and averaged 4.4 points (.509 FG%, .412 FT%), 2.7 rebounds, 2.14 blocks and 10.6 minutes. 2016: Started all 10 games for the HEAT in which he appeared and averaged 12.0 points (.681 FG%, .591 FT%), 10.9 rebounds, 2.80 blocks and 29.1 minutes…missed four games due to injury…ranked second in the NBA in blocks per game in the 2016 Playoffs…led the HEAT in field goal percentage, blocks, double-doubles, dunks and offensive, defensive and total rebounds…topped Miami in rebounds a team-high nine times, in blocks a team-high eight times and in steals twice…scored in double figures seven times, including one 20-point performance…grabbed double-figure rebounds seven times and posted six double-doubles…started all seven games in the Opening Round series vs. Charlotte and averaged 13.1 points (.698 FG%, .581 FT%), 11.4 rebounds, 3.43 blocks and 29.1 minutes…led Miami in field goal percentage, blocks and offensive, defensive and total rebounds vs. the Hornets…became the first player in HEAT postseason history to post a double-double in each of his first three postseason games with Miami…made his NBA postseason debut in Game 1 on Apr. 17 and recorded a double-double with a postseason career-high 21 points, 11 rebounds, three blocks and two steals in 26:16 of action…had 17 points and 13 rebounds and was a perfect 8-8 from the floor in Game 2 on Apr. 20…the eight field goals made without a miss in Game 2 set the HEAT single-game postseason record for most field goals made without a miss…hit 10 consecutive field goal attempts between Games 1-3…had 13 points and a postseason career-high 18 rebounds in Game 3 at Charlotte on Apr. 23…started all three games he appeared in the Eastern Conference Semifinals series vs. Toronto and averaged 9.3 points (.625 FG%, .615 FT%), 9.7 rebounds, 1.67 steals, 1.33 blocks and 29.0 minutes…suffered a sprained right knee 1:06 into the second quarter of Game 3 on May 7 and missed the final four games of the series. 2016-17: Was named the Eastern Conference Player of the Week for the week ending Mar. 19…led the NBA in rebounds per game and defensive rebounds per game…2015-16: Earned NBA All-Defensive Second Team honors…led the NBA in blocked shots. Played one season at Marshall University before becoming an early entry candidate for the 2010 NBA Draft…appeared in 34 games (23 starts) and averaged 13.2 points (.524 FG%, .588 FT%), 8.9 rebounds, 5.35 blocks and 26.1 minutes…was named both the Conference USA Freshman and Defensive Player of the Year after setting school records for single-season and career blocks (182), leading the nation while finishing with the second-most blocks ever by a freshman and the fourth-highest single-season total in Division I history…his 182 blocks also set the Conference USA single-season record…earned AP Honorable Mention and Sporting News Second-Team All-America honors…was named to the Conference USA All-Freshman Team and All-Defensive Team and earned All C-USA Second Team honors…recorded the first triple-double in Conference USA and Marshall history when he tallied 17 points, 14 rebounds and 11 blocked shots against Brecia on Dec. 16, 2009…led the NCAA with three triple-doubles. Full name is Hassan Niam Whiteside…his nickname is “Young Whiteside” because he’s always looked so young…is the son of Hasson Arbubakrr and Debbie Whiteside…has six brothers and three sisters…his father played in the NFL for the Minnesota Vikings and Tampa Bay Buccaneers and in the CFL with the Winnipeg Blue Bombers and the Ottawa Rough Riders…is active in causes which bring awareness to Autism and is inspired by his brother Nassan who is autistic…has participated in charitable events in Miami which have benefitted Nassan’s Place, a non-profit corporation that is helping to make a difference in the lives of children and families affected by autism in underserved communities by providing educational and recreational programs, social outings and resources…traveled to Africa in the summer of 2018 to participate in the 16th edition of Basketball Without Borders Africa and played in the NBA Africa Game 2018…led The Patterson School to a 34-2 record and a No. 1 national ranking as a high school senior in 2008-09…played at East Side High School in Newark, NJ as a junior and had his jersey (32) retired on Jan. 18, 2018…was hit by a car that was going 55 miles per hour as a 10-year old while he was walking to the store, suffering a broken leg and needed a defibrillator to be woken up after surgery…enjoys playing video games in his free time…wears size 16 sneakers.